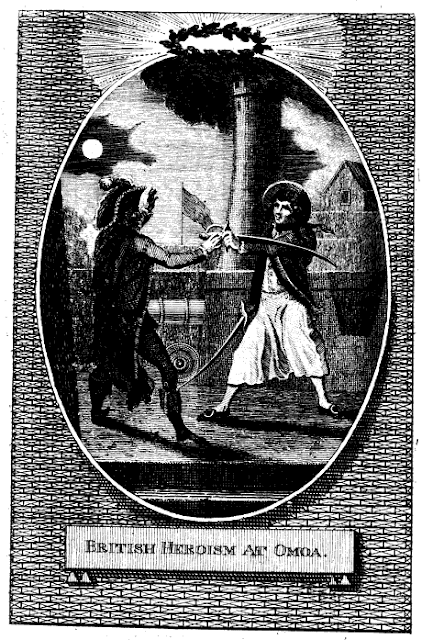 British Heroism at Omoa, artist unkown, in The Gentleman's and London Magazine: Or Monthly Chronologer, August, 1789, Google Books. The latest in the images I have thus far collected of the British tar at Omoa, this print accompanied a brief description of the event published in the August 1789 edition of The Gentleman's and London Magazine: Or Monthly Chronologer. One brave Castilian, resolved to conquer or die, threw himself before the brave British tar, and opposed him with all the vigour and skill he was master of, but was quickly disarmed. But the generous victor, disclaiming to take advantages, took up the sword, and presented it to the owner, "Now," cried he, "we are on equal terms; defend yourself. I scorn to attack an unarmed man" The Spaniard, struck at his generosity, received his sword, and bravely defended himself; but was soon forced to yield. "Generous Conqueror!" cried he, "I am in every way your inferior. You first overcome me by your valour, then by your generosity, and now again I am forced to submit. But where such heroism is found, resistance is vain, and opposition fruitless." The author is so bold as to go even further with this syrupy exaggeration by claiming that the sailor was given instant preferment, something not mentioned in the original dispatches. A sailor so supernaturally skilled at combat and mercy as to make a Spaniard decry himself as 'in every way your inferior' should look uncommonly gallant. Our unknown engraver has done his best to imbue the British tar with a manful and gallant look. The tar wears a round hat with wide brim bound with tape. 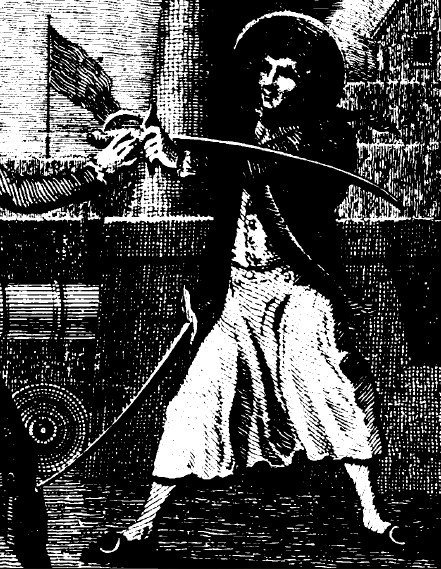 From his right shoulder to his left hip is draped a baldrick for his cutlass, which is clasped in his right hand. He wears a dark jacket that ends about the top of the thigh (though it is difficult to be certain). A single breasted jacket runs down to the plain petticoat trousers where it might be tucked in. The petticoat trousers themselves have a 'broad-fall' fly and end about the top of the calf. White stockings run to pointed toe shoes with large oval buckles. The resolution isn't high enough to be certain, but the straps of his shoes might be trained in the sailor's fashion.